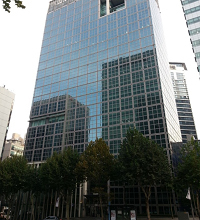 ORIX Capital Korea Corporation is the diversified leasing company established in February of 2004 for the first time in Korea as a Japanese company. (ORIX invested 100%). Today, ORIX had combined group companies related to automobile such as auto-leasing, rent-a-car and then established ORIX Auto Corporation in January of 2005 to be the one from the number one in the industry and also is trying to be the number one of leasing companies in the world from the number one of leasing companies in Japan. ORIX is the diversified financial service group developing a leasing business in 26 different countries including Singapore, Malaysia and Australia etc. Accordingly, ORIX Capital Korea Corporation also has been changed to the diversified leasing company carrying services of long term rental car, general equipment leasing, installment, Loan as well as auto-leasing. Collateral Loan, Real Estate Financing. Protrusion circle in the center represents Earth. It's the ORIX Group's strategy of Globalization. Lines represent variety of products and one stop service that ORIX provides.